So I updated my S5 to Android 6.0.1 using Cyanogenmod, and I’ve noticed some slight lagging. Apps tend to close themselves randomly, normally when less apps are running than on Android 5.1.1. Also, when using the tethered connection, there’s some lag there too, causing my online games to judder. Though that part is only hypothetical, I’m going to test this by downgrading my phone back to 5.1 and verifying whether there’s lag on my connection there. If there isn’t, I’ll report this as a bug. Am I the only one who is the slightest bit suspicious by this convenient “heart attack” – just a couple of months after he resigned and soon after the scandal really took hold? As you might know already, Swiftkey is going to be bought by Microsoft. And suspiciously, this morning I found an update to Swiftkey. But it keeps failing to install. The other 6 updates installed fine. 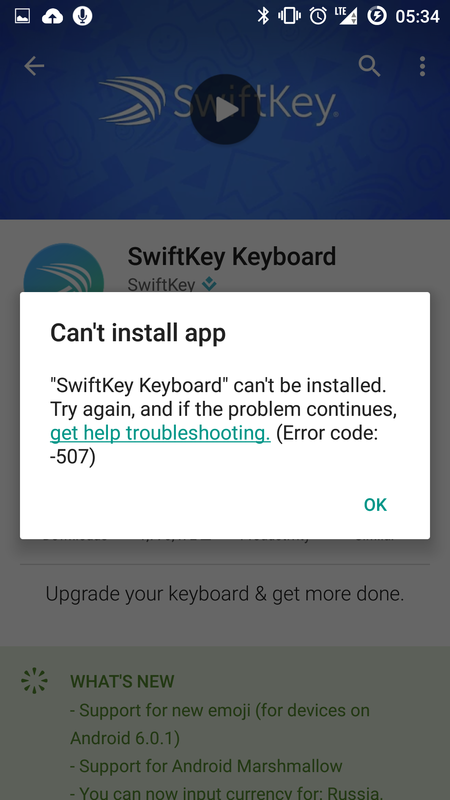 Just Swiftkey refuses to update. Suspicious? Or just coincidence?